The story on Honda's rise to #2 [6 Dec 2012 Nikkei 12年の国内新車販売、ホンダ２位浮上へ　「軽」で躍進]. Much more important, though, is the Bloomberg story by Alan Ohnsman on the rise of the US as an export base for the Honda Accord. Why? -- production in Japan has ceased. Now the auto industry has long worked to produce where vehicles are sold. That shortens supply lines and improves the link between sales and production. It also avoids foreign exchange risk, still painful at today's rate of US$1.00 = ¥82.46. Of course that's good news for Ohio, as it will mean Honda will have to add capacity, on top of that being added by Chrysler at the Jeep plant in Toledo. It does however represent the gradual shrinking of the industry in Japan. With an aging population, that's bot inevitable -- the number of licensed drivers is already declining -- and necessary. Japan needs more and more healthcare workers. Over time it can (and will) generate them by shrinking manufacturing. A prominent trade economist once quipped that the US had an extremely efficient automotive industry in Kansas wheat farmers. Well, in the same vein it's our turn: Ohio car plants will henceforth support healthcare in Japan. 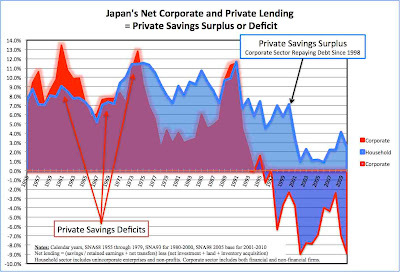 For those who go back a long time, Japanese banking used to be characterized by "overborrowing", "overlending" and "overbanking" – high debt/equity ratios in the corporate sector, and borrowing too much money from the Bank of Japan, all in the days when there was no bond market. There was also a lot of competition, with mutual savings banks and credit associations lending to small firms, regional banks to mid-tier firms and the "city banks" to large ocely documented in an open-access paper by Takeo Hoshi and Anil Kashyap, Japan's Financial and Economic Stagnation Journal of Economic Perspectives 18:1 (2004), 3-24. Now Norinchukin and a group of small-business oriented banks are already lending to the private sector; historically the small business banks did this through local small business banks. This pushed down interest rates and discouraged regular banks from aggressively pursuing such business, which is sufficiently profitable in the US to lead to the continued founding of new community banks. But this article suggests direct, aggressive direct lending for perceived growth sectors of "food" and "pharma" with subsidized interest rates. Meanwhile, what's happening in the "straight" banking sector? 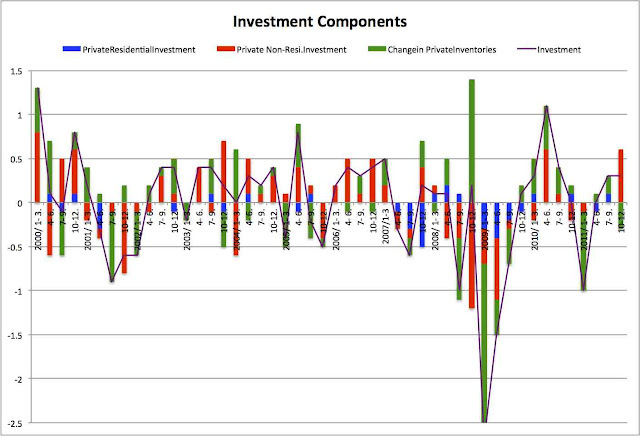 Hoshi & Kashyap documented the large size of the sector, given the post-bubble decline in lending. They predicted it would shrink. They also called on Japanese banks to move away from straight lending into fee-oriented businesses – the core of the US "shadow banking" boom. To my knowledge, the big Japanese banks remain overstaffed and unduly bureaucratic, losing market share to smaller regional banks, such as Chiba Bank and the Bank of Yokohama. [Not all such banks are faring well, with several forced mergers of failing regional banks.] So there are still too many banks. Nor is their fee business large, and their attempt to move into that segment (buying up the large personal finance companies that had their origins in loan sharking) has led to huge losses. I've not (yet?) tried to revisit this issue, but my suspicion is that there's still a lot of restructuring to go, and that the overall environment remains one that leaves the banking sector as a whole weak in profitability. I'm 99% sure that Japan remains overbanked. Japan's historical experience with the gold standard suggests great costs accompanying "toughing it out" in an attempt to preserve a fixed exchange rate, and that by delinking economies can rebound quickly, even in the midst of a depressed global economy. Geopolitical calculations drove Japan to adopt the Gold Standard: it wanted to access London capital markets to secure its place vis-à-vis other imperialists in Asia. In addition, political events dictated the timing: Japan demanded that the spoils from winning a brief war against China in 1895 be paid in gold in London. Others such as Argentina adopted gold for their own strategic ends. But this de facto monetary union was not backed by political union and was among dissimilar economies. Policy set in London (and later in New York) did not always work towards their best interests. Furthermore, the goal of the policy – to allow issuing bonds in London to finance greater imports – worked in tension with the pressure of the gold standard to "balance" trade since Japan could not play a game of borrowing ever, particularly when the domestic economy expanded faster than productivity. This capped growth in the period before 1914, which collapsed with the start of war in Europe. During World War I the economies of non-combatants boomed. Japan entered the 1920s with a stronger economy and a nascent electorally-driven cabinet system. But even though the international currency system collapsed with the onset of war in 1914, the Very Serious People of that era worked hard to reestablish it, and insisted that Japan should not merely rejoin, but rejoin at the old parity. Because of shifts in demand as the global economy transitioned from war to peace, exports remained anemic. Returning to the old parity meant Japan would have to deflate its way back to competitiveness. Now Japan's two main political parties did not see eye-to-eye on that issue; when the Seiyukai was it power, it favored rural relief and monetary easing. But over the course of the 1920s as a whole the conservative forces of the Minseito dominated. 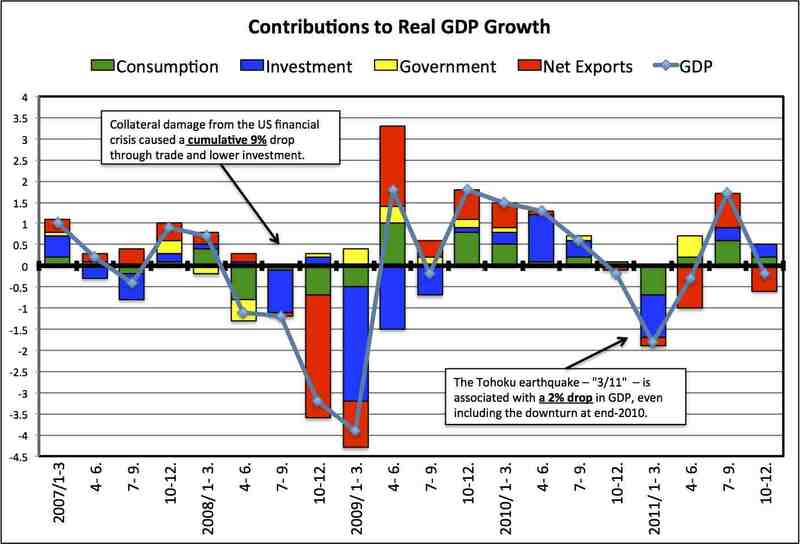 The result for Japan was over a decade of economic pain that accentuated the tensions of its nascent development as political leaders imposed deflation in an attempt to restore competitiveness. Farmers and migrants to Japan's growing cities fared poorly. To push down prices Japan fostered rice and other agricultural imports from Korea and Taiwan, by then formal parts of its empire. Rural-to-urban migration combined with suppression of unions held down wages. Money remained tight across the 1920s as a whole, and as policy aimed to strengthened the yen, industrialists had little to cheer in practice even if many supported the Minseito. Nationalist, imperialist and socialist movements gained footing, including in the military – and all resented civilian control with its austere budgets, which limited military modernization, investment in colonies and expansion in China. Japan relinked the yen to gold January 11, 1930, not long after the breaking of a "bubble" including the collapse of the Bank of Taiwan and many other banks in 1927, and just as the U.S. and Europe were sliding into what would soon become the Great Depression. That transmitted the full force of problems in the Atlantic across the Pacific, to an economy and a political system unable to survive the impact. Tight money – the US wanted to restrain gold outflows – and declining trade both hit the economy, accentuated by the sharp drop in prices for the goods Japan exported. The Minseito cabinet headed by Prime Minister Hamaguchi fell in December 1931, but while cabinet government continued, the political system was already destabilized. Indeed, on Sept 18, 1931 a group of officers staged an incident in Manchuria that led to war in a limited region of China. From 1936 and the assassination of Takahashi, (competing!) factions of the military dominated the cabinet. By toughing it out Mediterranean Europe is setting itself up for a decade or more of severe unemployment and accompanying ills. Politics are one. There is however another side to Japan's story: an economic boom during most of the 1930s. When the Hamaguchi cabinet fell, the Seiyukai put together a cabinet under Prime Minister Inukai who named Takahashi Korekiyo as Minister of Finance. On December 13, 1931, the first day the new cabinet was in office, Takahashi dropped the link between gold and the yen, allowing its currency to depreciate. While that was initially aimed at quelling the draining of Japan's gold reserves -- by that time both the US and the UK had left gold -- Prime Minister Inukai was assassinated in a coup attempt on May 15, 1932. Thereafter policy gradually changed to a full-fledged expansionary stance of "easy" money (under Fukai Eigo at the Bank of Japan) and greater domestic expenditures. Takahashi put together packages of rural relief, expanded the budget for the military and otherwise boosted expenditures. Freed of the shackles of gold, stimulus worked. 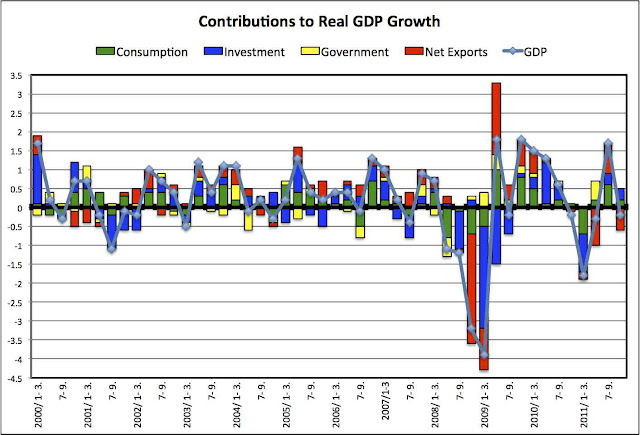 Exports to Asia increased, domestic output rose, urban growth returned, and by the end of 1933 the recession was over; by 1936 inflation became a problem. Takahashi proposed returning policy to a neutral stance, including trimming military expenditures. However, four years of solid growth proved insufficient to normalize politics. He was assassinated – Prime Minister Inukai barely escaped with his life – and the cabinet fell. The replaced cabinet was dominated by the military, and over the next two years the government became increasingly interventionist but without the cohesion of any overarching economic vision, while the generals proved unable to agree among themselves or to get field officers in China to consult before launching military action. The nation drifted into war and economic chaos. So while I see no benefits to Greece or Spain from trying to remain in the Euro zone, quitting would be very messy. Japan was never integrated into the US or UK economies, shared no borders with other gold standard members, never dropped the yen as its currency. Domestic bank accounts and contracts were never denominated in gold or dollars or pounds sterling. That is not the case with Greece or Spain. Intra-euro-zone trade is high; there is no separate currency that can by fiat delinked from the Euro. There is no solution, only bad and worse alternatives. Convenience should not justify sticking with the worst. Bryan, Steven (2010). The Gold Standard at the Turn of the Twentieth Century: Rising Powers, Global Money, and the Age of Empire. New York: Columbia University Press. Metzler, Mark (2006). Lever of Empire: The International Gold Standard and the Crisis of Liberalism in Prewar Japan. Berkeley: University of California Press. Moulton, Harold G. (1931). Japan, An Economic and Financial Appraisal. Washington, D.C.: The Brookings Institution. See the note below on Inoue, the patron of the Brookings study. Shizume, Masato (2009). "The Japanese Economy during the Interwar Period: Instability in the Financial System and the Impact of the World Depression." 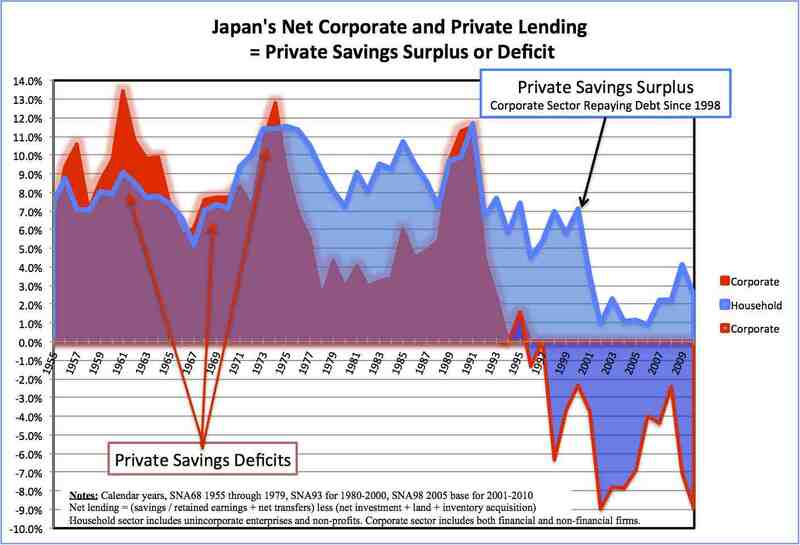 Bank of Japan Institute for Monetary and Economic Studies Working Paper 2009-E-2. Note: Wakatabe traces the policy debates of that era, noting (pp 11-15) that while business leaders were divided, the financiers who led the rescue of the financial panic of 1927 were of one mind, and their opinion ruled the day. The most prominent of these individuals, Inoue Junnosuke, became finance minister in the Hamaguchi cabinet and in that capacity oversaw Japan's return to gold at the old parity. Overall the "liquidationist" school dominated, including by economists at Tokyo Imperial University, by the leading newspapers and so on. Most were staunchly liquidationist; many were explicit that the initial impact would be a deepening of the recession but that this would be necessary to address structural problems, just as it had been necessary to shut down unhealthy financial institutions in the financial panic of 1927. Noted opponents included the journalist (and postwar prime minister) Ishibashi Tanzan, of Toyo Keizai and Takagi Senjiro of Kobe University, who was a PhD student of Irving Fisher at Yale. If nothing else, they were overwhelmed by the vast outpouring of publications by those in favor of returning at parity. For details see 若田部昌澄 (Wakatabe Masazumi) 「昭和恐慌をめぐる経済政策と政策思想：金解禁論争を中心として」 ESRI Discussion Paper Series No. 39, June 2003. In English there is a biography of Takahashi by Richard Smethurst that provides coverage of this era, From foot soldier to finance minister: Takahashi Korekiyo, Japan's Keynes. Harvard University Press, 2007. I read Metzler's book a couple months ago; Smethurst's is next on my list. Here I am on the Japanese economy on the Canadian Business News Network. The System of National Accounts Yearbook for FY2010 is now out; Japanese GDP data unfortunately are not available very promptly and many subaccounts are only available on an annual basis. Anyway, long-standing frustrations aside, the data highlight first the tendency of the economy towards an excess of private savings since 1970. Tracing the outworkings of that provides one way to organize what has happened in the macroeconomy over the past 40 years, with the growth of both current account surpluses and government deficits, in the context of two bubbles, in the 1972-3 period and in the era ended abruptly in 1991. More sobering from today's standpoint in the US and the EU is the magnitude and duration of deleveraging. Unlike in the US, the late 1980s bubble was driven by corporate borrowing; households were for example net sellers of real estate, particularly land. And so it's corporate deleveraging to which we need to look; that's gone on for 15 years. In the US, the household sector is central, and I don't think the story will be as bad, helped by generational dynamics, foreclosures and population growth. I won't try to model such here. Just look at the graph...data for 1955-2010, splicing together discontinuities due to the shift from SNA68 to SNA93.